Police in Nepal have arrested dozens of protesters for attempting to launch a nationwide strike to express their dissatisfaction with the controversial draft of the new constitution. 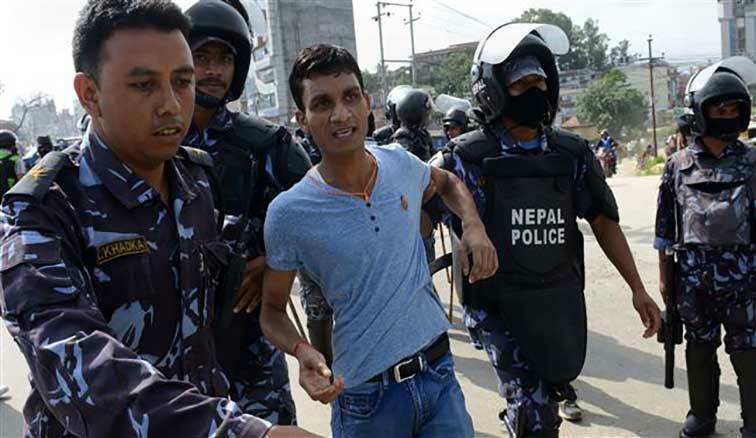 “We have arrested 51 cadres in Kathmandu for trying to block roads, vandalize vehicles and close shops,” police spokesman, Bishwo Raj Pokharel, said on Sunday. Earlier this month, Nepal’s four major political parties signed an agreement to redraw the Himalayan country’s internal borders in the draft law, which will be presented for a vote to the parliament at the end of August. However, the move prompted angry reactions from several lawmakers who called for a nationwide strike, saying that the proposed administrative division of Nepal into six provinces discriminated against the country’s historically marginalized communities. The new draft law was a condition of a 2006 peace deal with Maoists rebels, which brought an end to a 10-year civil war that killed some 17,000 people in the country of nearly 28 million people, divided among over 100 ethnic groups and many castes.